Dental braces have changed in recent years. There are many misconceptions about types of braces and how to find a dentist to treat you. This article explains all the basic things that you should know before you commit to several years of orthodontic treatment. When most people think of orthodontic braces, they think of teenagers. But an increasing amount of adults are getting braces, too. As long as your teeth and gums are healthy, you could benefit from getting your teeth straightened. One of the most important things to consider is the state of your gums and jaw bones. If you have unhealthy gums, a lot of gum recession, or bone loss, braces may not be recommended because the pressure they put on your gums could cause unfavorable complications. Why do people get braces in adulthood? Usually, their families could not afford braces when they were children. Now that they are adults, they want to improve their smile and their dental health. Some adults had braces as children or teenagers, but didn't wear their retainers, causing their teeth to become crooked again. And still others have more complicated cases, which may involve jaw surgery and braces. Many people wonder how much dental braces will cost. The average cost of a two-year orthodontic treatment with metal braces is between $3,000 to $6,000, depending on where you live. Ceramic or special brackets may cost more. Invisalign treatment costs about the same, or more. Payment is usually made through an initial down payment, and then monthly payments. One of the most important things that orthodontists evaluate is your "bite." This is the way that your top and bottom teeth meet when you open and close your mouth. Orthodontists are just as concerned with how your mouth functions as they are with making your teeth look great. After all, what good are straight teeth if you can't chew or speak properly, or if you get TMJ headaches? You may love your family dentist, and he or she may have told you that they can "do your braces" for a lot less money than an orthodontist. While this is very nice, it's also a big gamble. On the ArchWired.com message board, we have read about many people who got braces done by a regular dentist who didn't really understand how complicated their case was. These people wound up needing to go to an orthodontist for more years of braces to un-do the faulty work of the dentist. Orthodontists are specially trained in tooth movement and jaw function; dentists are not. Yes, some dentists have taken a few course hours to learn how to do Invisalign or other types of treatment, but that is not the main thing that they do. Would you get heart surgery from a doctor who only operated on hearts once or twice a year? Of course not! Orthodontists first go to dental school and become dentists. Then they attend an Orthodontic program for several more years to learn specifically about tooth movement, jaw function, and facial aesthetics. After that, they take a special exam to become Board Certified. Which brings me to another point: when you choose an orthodontist, make sure that he or she is Board Certified. That way, you are assured that they are totally trained, and that their work is expected to live up to certain standards. Does this mean that a regular general dentist should never do braces? No. Some general dentists have successfully treated many patients for simple tooth movement. It's all a matter of experience. Ask your dentist how many orthodontic cases he has done in the past year. Ask how complicated your case is. Remember, braces will not only straighten your teeth, they can change the function of your bite and the mechanics of your jaw. If your treatment is complicated and is not done properly, you may wind up needing to go to an orthodontist to finish the job, which will cost you more money in the long run. 4. Consultations are usually free. Get as many as you need! Many people get a referral to an orthodontist from their dentist, or from a friend. Most orthodontists do not charge for a consultation -- consultations are usually free! If you do not like one orthodontist, or want to get several opinions, it's OK to do so. Don't worry, you won't offend anyone! In fact, it's usually a good idea to get at least two or three opinions before going ahead with braces. This is especially true if an orthodontist has recommended that you get teeth extracted, or if your case is complicated. There are many ways to move teeth, and different orthodontists use different approaches. There is usually no "one right way." You need to evaluate what the different orthodontists tell you and decide what you are comfortable with and what you can afford. During a consultation, an orthodontist will get to know you and take a good look at your teeth and your mouth. An experienced orthodontist will be able to tell you, with a fair amount of accuracy, what needs to be done: what types of braces you could wear, whether you need extractions, how long your treatment might be, and (ballpark) how much it might cost. Once you have picked an orthodontist, you will need to get a mold of your mouth done, and panoramic x-rays (and sometimes also photos of your face). Using these tools, the orthodontist will be able to develop a treatment plan for you. Until he does that, he will only be taking an "educated guess" at what needs to be done to fix your smile. Once he has worked up a treatment plan, he will know exactly what needs to be done. At that point, you will come back to his office, and he will explain all the details, including the exact cost. Not everyone is a candidate for Invisalign or similar "invisible braces treatments." Most adults go into an orthodontist hoping that they can get Invisalign, but only a percentage of them are actually good candidates for the plastic aligners. The reason is: some types of treatment just don't work as well with Invisalign as they would with traditional braces. And when I say "traditional braces" I don't mean all metal. There are many tooth-colored brackets on the market that are less conspicuous and work just as well as metal brackets. You need to trust your orthodontist if he tells you that he would not be able to treat you with Invisalign or other types of brackets you may have heard of. If you had your heart set on Invisalign or some other system, then ask why it won't work. It's OK to ask why, and it's better for you to fully understand the orthodontist's approach before your treatment begins. With that said, you should also understand that these days, the companies that make orthodontic brackets and appliances spend a lot of money on advertising and marketing. Any good orthodontist will tell you the truth: it's not the brackets that make the difference, it's the technique and experience of the orthodontist who is treating you. Sure, some of the newer brackets have advantages because they are smaller, less noticeable, or don't require elastic "o-ring" ligatures. But that doesn't make them any better than other types of brackets. Another thing to consider is this: orthodontists need special training to use some types of brackets. For example, an orthodontist must be trained by the company that makes Damon brackets before he can use them on his patients. Same for lingual ("behind the teeth") braces. If your orthodontist doesn't have the extra training in these specific products, he cannot offer them to you. So don't get hung up on one type of bracket or one type of treatment. Trust the experience of your orthodontist. If you don't like his approach, you can always get another opinion from a different orthodontist, or find one that offers the type of brackets you had in mind. Braces aren't cheap. If your braces are covered, even partially, by a dental plan consider yourself lucky. The average cost of orthodontic treatment is between $3,000 and $6,000, depending on where you live and what needs to be done. Invisalign usually costs as much as traditional braces, and sometimes it costs more. Usually treatment costs more in major cities than it does in rural areas. You will not be expected to pay it all at once. Usually you pay separately for molds and panoramic x-rays. Then when treatment begins, you pay a down payment of about $1,000. The balance is usually put on a payment plan, where you pay several hundred dollars per month. Some dental offices offer a discount for paying upfront in advance for all your treatment. While this may be tempting, it is not recommended. You never know what will happen during the course of your treatment. What if the office goes out of business? (It has happened to a few unlucky patients). Saving money is great, but protecting yourself financially is even better. While most orthodontists are ethical and run a financially sound practice, there are rare occasions where that is not the case. Being on a payment plan is always the best way to go. How long will you be in braces? That depends on your individual case. The average treatment is two years (24 months). There are methods for moving teeth faster, but before you choose those, get all the information you can about what the treatment will entail. There is one six month method, for example, that incorporates fairly painful jaw surgery to accomplish its goals. Know what you're getting into beforehand. Two years in braces may seem like a long time, but it will go by faster than you realize, and is often safer and more reliable than the newer quick methods. Before you begin orthodontic treatment, your orthodontist will draw up a treatment plan and have you sign a contract. Read the contract! It tells you a lot of important details, such as terms of payment, what happens if you miss payments, and whether retainers are included in your treatment cost. If something goes amiss during your treatment, your contract is a binding legal document. Don't think, however, that your orthodontist is going to cast you aside if you miss a few payments. If you suddenly begin to have financial difficulty, talk to your orthodontist or his office manager about working out new terms with you. As long as you try to make payments in earnest, most orthodontists will continue to treat you. In a perfect world, you pick an orthodontist and stick with him for several years until your treatment is finished. After all, you have signed a contract stating that you agree to pay $x for x-number-of-years. But sometimes life throws us a curve and we need to uproot ourselves and move. There are a few things you need to know about moving once you begin orthodontic treatment. First of all, you may be entitled to get a partial refund for your treatment if it is not totally paid off. That depends on...you guessed it...your contract. Secondly, once you are in new city, you will need to start over with a new orthodontist. There is usually no "treatment in progress" discount for new patients. In fact, it can be more complicated for a new orthodontist to finish your treatment, because (as stated earlier), different orthodontists have different approaches. To make sure that your new orthodontist picks up where your old one left off, ask your old orthodontist to give you your records (or give him the address to forward the records). It might possibly cost you less to complete your treatment with a new orthodontist, but don't count on it. You may need to start over financially, so be prepared for it to cost you several thousand dollars more. Why bother to spend thousands of dollars and years of your time on your teeth, and then ignore your oral hygiene? When you have braces, you will need to brush your teeth several times per day, ideally after every meal. This may sound like a big pain, but you'll get used to it. In fact, you will want to brush your teeth often, because food gets stuck between your brackets, which can be really disgusting and cause bad breath and tooth decay. At the very least, you should swish your mouth with water after eating. You can get an orthodontic toothbrush or use a regular soft toothbrush. The important thing is to clean your braces thoroughly, making sure that there is no food debris on any of the brackets. You should also floss at least once per day. It isn't always easy, but there are many "floss threader" products on the market that help. Your orthodontist can show you how to brush and floss properly. Speaking of brushing, remember that you should not use a whitening toothpaste when you have braces. It could cause you to have "two tone" teeth after the brackets are removed! Another thing to remember is that although a device like a Waterpik is great for gum stimulation and dislodging food, it is not a substitute for flossing. Even if you use an oral irrigator like a Waterpik, you still need to floss daily. Because you will be brushing so often, it helps to keep a dental kit with you. 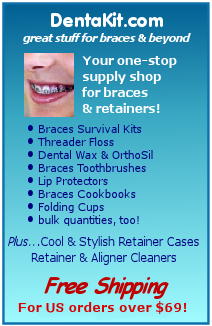 DentaKit.com has one that includes everything you need, including a spill-proof folding cup. You can see it here. Yes, it hurts to wear braces at first. It doesn't hurt to get them put on your teeth; the pain and pressure come a day or two later. Not only will your teeth feel sore, but the brackets will rub the insides of your gums and lips and cause mouth sores. This is not pleasant, but fortunately this stage only lasts a couple of weeks. Soon scar tissue forms inside your mouth and everything hurts less. To soothe the mouth sores, rinse your mouth with warm salt water several times per day, or use a mouth rinse like Rincinol PRN. Take Tylenol or Motrin for the pain -- narcotic painkillers are not necessary. Use a lot of dental wax or get a lip protector for braces. The initial stage of braces is not fun, but it passes soon enough. You will need to eat soft foods and chew very slowly and carefully. Believe it or not, in a few months the braces won't bother you very much at all. Some people are allergic to nickel, which is found in some brackets and wires. Some people are allergic to latex, which is found in o-ring ligatures, elastics, and exam gloves. And recently, it seems that some people are allergic to something in the plastic of aligner trays and plastic retainers. If you know that you have an allergy or sensitivity to any substance, tell your orthodontist or dentist. There are always alternative products they can use which won't cause problems for you. Even if you've never before had an allergic reaction to a substance, you can suddenly develop an allergy at any time. If you feel that your braces or retainers are causing an overabundance of mouth sores, or if you develop upper respiratory symptoms, hives, or swelling, tell your orthodontist. If you feel that your throat is swelling up or you are having an obvious allergic reaction, go to your nearest Emergency Room. If you feel that you can't breathe, call 911. Do not take these sort of reactions lightly. A severe allergic reaction can kill you in a matter of minutes. After your braces come off, your orthodontist will make a mold of your mouth and produce a set of retainers. The type of retainer you need depends on your case. Sometimes, orthodontists recommend a bonded permanent retainer to ensure that your teeth do not move at all. Aside from a permanent bonded retainer, there are two other types that most people get. A Hawley Retainer is made of acrylic and metal. The acrylic goes behind your teeth and up against your upper palate; the metal is in front of your teeth. This is the most reliable type of retainer. Your orthodontist can "tweak" the metal to help finish any small refinements that still need to be done to your teeth. An Essix Retainer is clear plastic and looks like an Invisalign aligner tray. Many people want this type of retainer, but it has its disadvantages. Many orthodontists feel that because it covers the biting surface of your teeth, they do not "settle" properly after treatment. For this reason, sometimes orthodontists give a patient both types of retainers: an Essix Retainer to wear during the day when they are people-facing, and a Hawley Retainer to wear at night when they are home sleeping. No matter what type of retainer your get, the most important thing is to wear it exactly as the orthodontist tells you. Most people need to wear their retainers 24/7 for at least 6 months, then switch to wearing it only at night when sleeping. How long will you need to wear your retainer? Forever. That's right, forever. Your retainer ensures that your teeth will not move back into their old crooked positions. If you have been out of braces for several years, you can switch to wearing it only few nights per week. But if you stop wearing it totally, you will be asking for trouble. Keep your retainer in a retainer case. Don't wrap it in a tissue. This is the most common way that retainers get thrown out. A new retainer costs around $250, so pay attention and take good care of it! Remember that it is important to keep your retainers clean. Like your teeth, your retainers can get a buildup of bacteria and white plaque. You must clean your retainers every single night with a bacteria-killing product like Retainer Brite, SonicBrite, or DentaSoak. These products are not sold in local stores, but you can get them on the web at sites like DentaKit.com. You can brush your retainers with a toothbrush and toothpaste, but this will not adequately kill the bacteria. A good retainer cleaning product will ensure that your retainers stay clean and fresh smelling.